I spent the day baking and I have some awesome recipes to share over the week!! I usually bake at least once a month but somehow I didn’t bake last month and I HAD to compensate with some sweet cake goodness this weekend…I made lemon curd tarts, strawberry jam tarts and a chocolate cake!! For starters, here’s how to make your own lemon curd tarts….they’re yummy, drool in the mouth, sweet and the tarts are light and buttery….delicious!! Sift flour and baking powder( there should be no lumps). Rub in the butter lightly with your fingertips until it looks like breadcrumbs (don’t knead like chapathi dough). Add sugar if you want and mix thoroughly. Line 12 muffin tins or patty tins with the rolled out shapes. Prick the centers of the shapes lightly with a fork. Bake in a hot oven at 205 degrees C (400 degrees F) for 15 minutes. When baked ( it should look lighter and will be solid not squishy) remove from patty tins and place on a plate to cool completely. Grate the yellow part of the lime skin and keep aside. Add the juice of the lime and its rind (grated in step1). Remove from the fire and beat in an egg. Remove from water and cool before using. 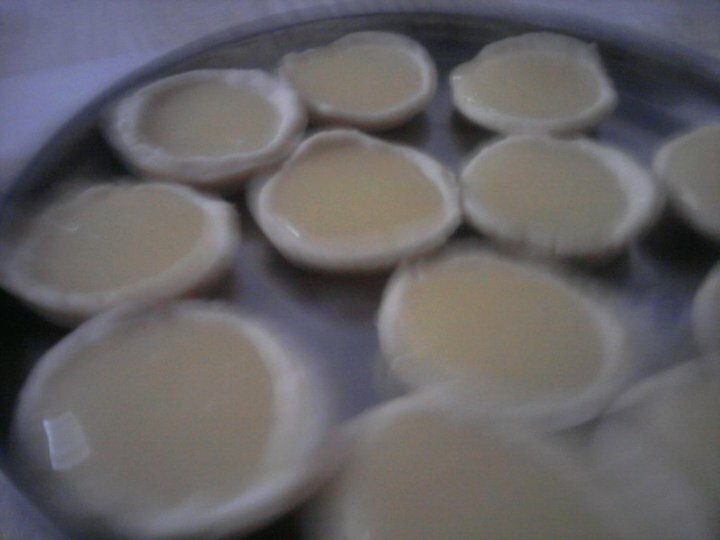 Spread into the pre-baked pastry cups (ONLY after both the lemon curd and the pastry cups are cool!!). Notes: These tarts taste equally good after being chilled in a refrigerator! The recipe was taken from The Thangam Philip Book of Baking. Any mallu worth her coconut oil should have heard of Thangam Philip! Her recipes are so easy to follow and she gives such sensible cooking advice too! Sounds yum. Definitely going to make this! Oh yes you must make these Niha!! They don’t turn out too yellow like store bought ones but I wanted to keep ’em natural so I didn’t add food coloring. Thank you! I hope to post more recipes soon.